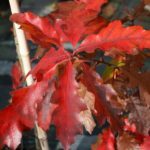 “Grow native” is the best advice for choosing trees and shrubs with the aim of attracting a diverse array of wildlife to your landscape and helping them to thrive. 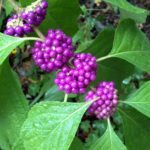 Incorporating native trees and shrubs into your yard can restore critically needed essential habitat for butterflies, moths, hummingbirds, songbirds and beneficial insects, and beautify it at the same time. 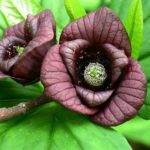 Native plants co-evolved with native wildlife species for thousands of years and therefore provide the basic support system for natives’ web of life. Native woody plants support biodiversity by providing food for native insects, that in turn are eaten by birds…in fact, 96% of birds must feed their babies insects and with few exceptions, native birds can only eat native insects and native insects are only attracted to native plants. It actually takes over 9,000 caterpillars to feed just one nest of chickadees. 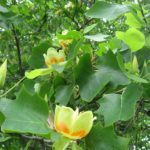 Native trees represent some of the most important caterpillar host plants, with a few groups – oaks, willows and cherries supporting the larval stage of hundreds of butterfly and moth species. A native tree is essentially a backyard bird-feeder. 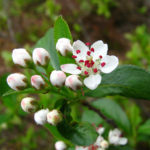 Native trees and shrubs also offer a whole buffet of food options in the form of seeds, fruit, nuts, sap, nectar and pollen to sustain wildlife and because they are typically well adapted to local climate, soils and growing conditions often require less water and maintenance than their non-native counterparts. An unusual spring flowering native shrub. 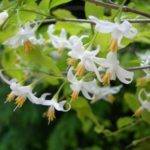 Fragrant white bell-shaped flowers with reflexed petals droop from the branches in late spring. The rounded leaves are dark green, bark is gray to reddish-brown. A shrub of subtle, elegant beauty. No appreciable fall color. Attracts pollinators, particularly bumblebees. 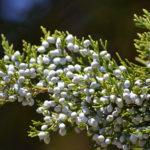 Flat-topped clusters of white flowers in late spring are followed by blue-black, berry-like fruit, which are very attractive to birds and wildlife. Glossy, dark green leaves turn yellow, orange or red in fall. Leaves smell sour. A deciduous conifer with a pyramidal form. Medium-fine, needle-like leaves are soft green in summer then turn rusty brown in winter and drop from the tree. Reddish brown fibrous bark. Forms woody knees in shallow water and in wet poorly drained soil. One of our most beautiful and underused native trees. Makes an excellent specimen tree, tidy shape. Attractive, glossy, dark green leaves that turn yellow, orange, and scarlet red in fall. Bark is dark gray to almost black, alligator-like patterns when old. Deep rooted, so difficult to transplant when mature. 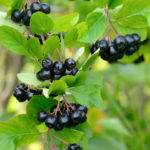 Aggressive, thorny shrubs that produce edible berries. 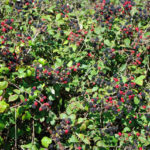 Black raspberry (Rubus occidentalis) has blue-green stems, long, arching canes and dark purple berries. Dried blackberry leaves used for tea. 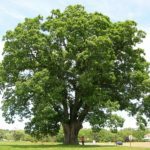 A moderate-to-fast-growing, long-lived tree with the largest leaves and acorns of all the oaks. Leaves turn brown or light yellow in the fall. Trees are weakly pyramidal when young then develop a massive trunk and broad crown with strong branches. 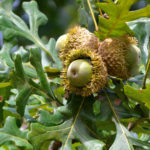 Oaks provide food and shelter to a wide range of wildlife. 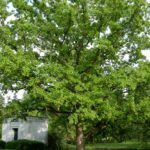 An attractive oak with toothed leaves like those of a Chestnut tree. Grows in limestone soils (a rarity amongst oaks). Foliage is green and shiny, turning to yellow-orange in fall. Gray bark and gnarled branch structure on old specimens. 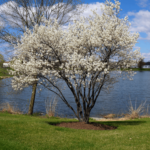 Small suckering tree or large shrub with attractive white flowers on 3-6″ long clusters in spring. Fruit is red, ripening to purple in fall. 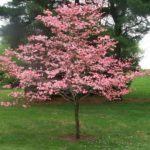 Grow as a screen or as an understory planting as it has unusual shade tolerance for a cherry. Forms large upright clumps. 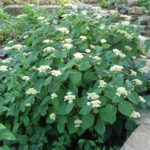 A large shrub or small tree producing white flowers in late spring followed by red berries on female plants in fall/winter. Fruiting requires pollination from a male plant. The berries persist through winter and are an important food source for birds. Bluebirds and mockingbirds especially like the fruit. 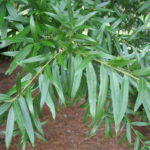 An upright evergreen with scale-like leaves that have a distinct fragrance when crushed or brushed. Plants are usually densely pyramidal when young. Small berrylike cones form in late summer and persist through winter. These blue fruits are about 1/8 in. across and very attractive. Birds, especially waxwings, love the fruit. Prolific, edible, deep pink flowers in early spring. Red-purple, pea-shaped seed pods follow the flowers. Heart-shaped leaves turn yellow in fall. Small, low-branched tree with spreading horizontal branches. 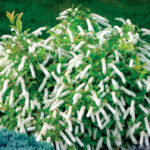 Distinctive white flowers, 3″ in diameter, bloom mid-April to mid-May. Clusters of glossy red fruit in fall persist into winter and are relished by birds. Consistent deep red fall leaf color. 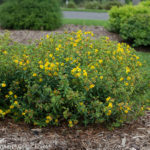 Low, irregular spreading shrub with lower branches that grow horizontally then turn up at the tips. Tends to sucker and root along stems that touch the soil, forming a dense stand. Yellow-green flowers appear before leaves emerge. Clusters of fuzzy red fruit form on female plants through June. 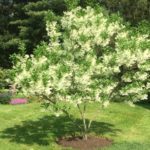 Shimmering, white frothy flowers blanket this shrub/small tree in May or June. Small, round, bluish olive-like fruit form on female trees in fall and are eaten by many types of birds. Leaves often turn bright yellow in fall. This beauty is a Plants of Merit winner. Dome-shaped clusters of small white flowers May-July give way to clusters of small white berries on short red stalks. 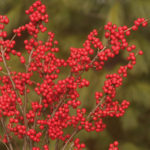 Distinctive red flower stems contrast with the white berries. Young branches and twigs are brown to red; older branches are gray. Green leaves turn dusky burgundy in fall. Medium to large trees with real character! Upright crown with heavy branches forms picturesque outlines. 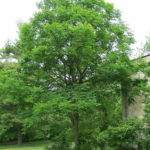 Tolerant and adaptable to a wide variety of sites, this native tree is a winner. 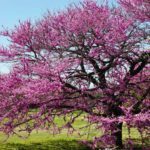 Select male trees if seed pods are not desired. 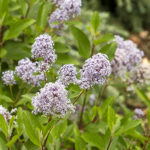 A low-growing, compact shrub that’s excellent for hot, dry sites. 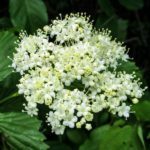 Billows of delicate white flowers form at the end of young branches in May and June. Clusters of small black fruit form in July and August. Spreading, horizontal, low-branched tree with great horizontal habit. 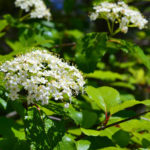 Flat-topped clusters of fragrant, yellowish white flowers in May or June are followed by handsome blue-black berries on red stems. Burgundy foliage in fall. 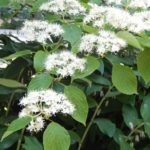 Good alternative to cold-sensitive Flowering Dogwood (Cornus florida) in northern areas. 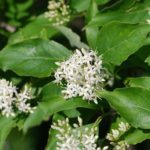 Multistemmed shrub or small tree with tropical-looking, 6-12″ long leaves. Edible, 2-5″ yellowish fruit is relished by many birds and small mammals. Plant is larval food of Zebra Swallowtail butterfly. Spreads slowly to form small colonies or thickets. A tall straight tree with a symmetrical, broadly oval growth habit. Leaves are yellow-green in summer, eventually turning yellow-brown in fall. Non-showy female flowers are followed by sweet, edible nuts. The nuts are surrounded by a thin brown husk. Strongly pyramidal tree with pedulous lower branches. 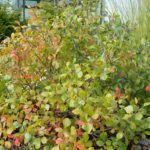 Glossy dark green leaves change to bronze or red in the fall. Dried, brown leaves remain on tree for much of the winter. Light brown acorns form in the fall and provide food for a wide range of animals. 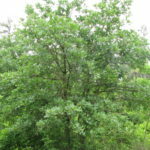 This oak produces a dense, round crown with strong spreading branches. Leaves are large and round lobed with the mid lobes considerably wider than those at the top and base of each leaf. Fall color can be a nice golden brown. 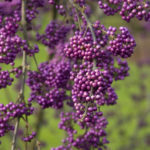 Superb shrub valued for abundant clusters of long-lasting, violet berries covering branches in fall. New growth has bronze tinge. Small, purplish pink flowers appear in summer amongst large green leaves. Excellent specimen or shade tree for large areas. Habit is pyramidal when young then develops irregularly rounded crown. 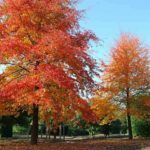 One of the first trees to color in fall, leaves may be bright yellow, flaming orange or red. Medium to fast growth rate. 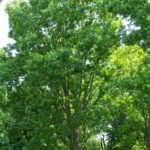 A large, statuesque shade tree, long lived with a relatively fast growth rate and good habit. Young leaves are a reddish color as they unfurl. Mature leaves are shiny dark green, deeply lobed and each lobe comes to a distinct point. 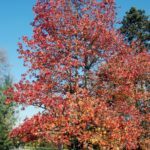 Fall color is russet-red to bright red. 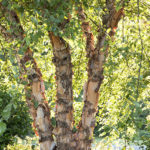 A vigorous, fast-growing tree with beautiful, exfoliating, multi-colored bark. Can be grown as a single trunk tree or as a multi-stemmed plant. Catkins are beautiful in early spring (April). Fall leaf color is yellow. Rounded, dense and large shade tree. Pale yellow haze of flowers in spring. 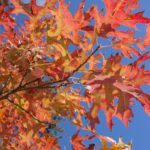 Fall color ranges from bright yellow, burnt orange to red tones. Fruit is the typical maple ‘helicopters’ which mature in Sept./Oct. Long-lived. A large and imposing tree, forming a fairly coarse outline with a broad crown, often above a short trunk.Leaves are fairly broad with shallow lobes, dark green and usually gray-green underneath. Fall color is yellowish-bronze, some trees are red-purple. Deep green glossy leaves are shaped like starfish. 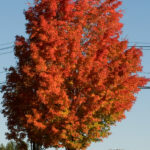 Foliage can turn a medley of yellow, orange, purple and red on a single tree. Golfball-size brown fruit with sharp points form in fall (considered a nuisance in traditional landscapes). A very large & fast growing shade tree. Probably not a good choice for small sites or confined areas. Pyramidal shape when young, round when mature and usually highly branched. Unusual maple-like leaves with the tip cut straight across. 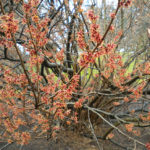 This unique native shrub flowers from late winter into early spring, when little else is blooming in the landscape. The fragrant flowers are clustered or solitary, yellow to dark red in color, and have four strap-like petals that are 1/4″-1/2″ long. Shrub with slender upright branches that eventually arch over; usually wider than tall. Very fragrant clusters of drooping creamy white flowers May-June. Dark green leaves turn scarlet and crimson in fall, remaining showy for many weeks. 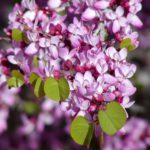 Beautiful in all seasons, this highly ornamental small tree is covered with masses of brilliant rose-purple blossoms in early spring. Rounded heart-shaped leaves emerge apple green, aging to blue-green. Long seed pods ripen to purple-brown in summer. A massive & majestic, long-lived and beautiful oak with year-long interest. 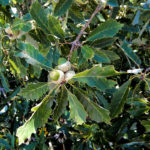 A dominant tree in many Missouri woods, with round-lobed leaves and smooth, medium-sized acorns. 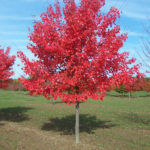 Foliage color is pinkish-white when emerging, opening to a medium green in summer, brown to various shades of wine red in fall. 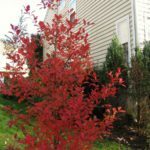 This fantastic native selection heralds Spring with bright red new foliage, turning rich dark green before a Fall finale of brilliant scarlet. Leafspot resistant. Red-tinged branches add winter interest. Small black fruit is loved by birds. Large clusters of flat, creamy white, flowers open in June and last for many weeks. Plants bloom most of the summer. Pollen-rich flowers attract many insects. Plants form rounded mounds. Flowers can be used in fresh or dried arrangements. 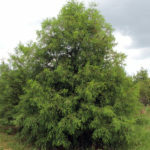 This useful tree is pyramidal in youth then becomes more of an oblong-oval as it matures.Bright green leaves shaped like beefy willow leaves turn yellow, yellow-brown and russet red in fall. Acorns form in late summer and provide food for wildlife. 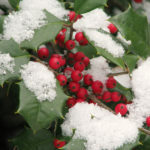 A native deciduous (loses its leaves in winter) holly grown for its outstanding berry display. 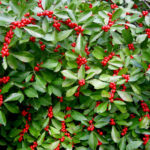 Small to medium size deep green shrubs with yellow fall color and showy red berries that ripen in September & persist sometimes into January. Often found in wet areas in the wild. 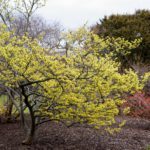 A tall shrub or small tree with yellow, fragrant flowers that open in late fall or early winter. Upright spreading branches form an irregular, rounded crown. The deep, golden yellow fall leaf color can be outstanding and will often show at the same time that the shrub is blooming.